Things have been busy and it's been a while since my last post, so I decided to write up a post today related to something I have been working on recently where in I needed a way to associate an attribute with a class and some of it's properties, but the values I wanted to pass in to the attribute constructor needed to be dynamic. We all know that attributes are; classes that can be tagged onto code artifacts such as Methods,Properties,Events,Delegates,Classes etc. When you tag a code element with an attribute, it is stored in the assembly of the target artifact as metadata. At runtime, you can then query an instance of a class/struct on which the attribute is defined (using reflection fo course) to find the attributes defined on on an artifact and can then take appropriate action. In the following code sample we have created an attribute class called SecuredAttribute which is used to store a collection of rolenames. The attribute is intended to indicate the roles that the calling thread's principal must have for accesing the artifact that has been decorated by this attribute. For simplicity, the attribute has been marked with AttributeUsageTargets.Property to indicate that it can only be applied to Properties but this can be extended to other targets(artifacts) as well. We have also created a simple Person class with properties - Name and Age. These properties are decorated with the Secured attribute. The drawback with this approach is that the role names are hard wired to the code. This means that we cannot achieve what we set out to do using attributes. Enter TypeDescriptor. A not so widely known(rather used) type from the System.ComponentModel namespace. A complete treatment of TypeDescriptors is beyond the scope of this article but in a nutshell, TypeDescriptors provide a mechanism for dynamically associating and querying metadata on instances at runtime. It also complements the .NET reflection APIs. TypeDescriptors are used heavily in the Visual Studio Designer property grids for manipulating properties of controls. Although TypeDescriptors are intended for use with components and probably well known in the control developer community, there is nothing that prevents it's use with plain old non-component .NET objects. TypeDescriptors allow creating and associating attributes dynamically, moreover the attribute constructors are not limited to just constant expressions, typeof expressions or array creation expressions. Hence, a custom attribute constructor can now accept as paramters, any .NET type including generics!. This is particularly useful in our case since we need to dynamically specify a collection of rolenames at runtime to initialize the the SecuredAttribute constructor. The caveat is that the attribute is not specified on the code artifact statically, but instead we do this dynamically by writing a CustomTypeDescriptor and a correponding provider. But before we do this, we need to introduce the following entity to help us along the way. /// An interface representing any type which needs to be secured. /// Gets the roles which have access to an instance of a type which implements this interface. 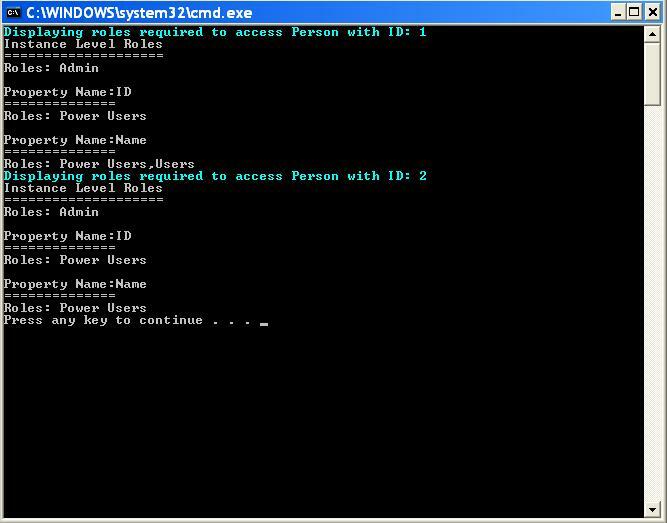 /// Gets the roles which have access to the specified property of an instance of a type which implements this interface. ISecurable represents any type for which we want to associate security information. It provides a mechanism to query the underlying instance to retrieve the roles which can access the instance aand or a specific property. The Person class implements this so that each instance of it can indicate the roles the caller needs to be in to access the instance or one of its properties. //Look up the roles that can access all the artifacts of this instance from some data source, for now let's fake it. //Look up the roles that can access the specified property from some data source, for now let's fake it. With this in place we are now ready to write a CustomTypeDescriptor and provider. All the descriptor does is dynamically create instances of SecuredAttribute and associates them with the instance. We have overridden GetAttributes in which we query the underlying instance to fetch the roles that can access all the artifacts of the underlying instance. Similarly, we have also overridden GetProperties which will in turn query the instance to fetch the roles that can access the specified property name. We are now ready to associate the SecuredAttribute with Person instances. //ensure that the property has been Secured. We are associating the TypeDescriptors in Main itself for the purposes of illustration, but this can easily be refactored into a factory class. The output of the above code indicates that attributes are indeed being applied and queried for dynamically. Associating the SecuredAttribute with artifacts besides Properties, such as events, methods etc. We haven't specified how roles are associated with the calling thread's identity, or specifically how roles are associated with the calling thread's identity on a per ISecurable instance basis. We haven't associated any permissions with roles. An API is needed that ties the above 2 and provides a mechanism to perform an access control check. This is left as an exercise for the reader. If I have some spare time we'll have a Part 2 to cover the above steps. Great post. This weekend I've been reading up on stuff like this, Dynamic Proxies and Reflection.Emit - has opened my eyes to a lot of creative ideas out there! Do you think this could be used for extending the ASP.Net Security model, i.e. being able to dynamically add a role to the PrincipalPermissionAttribute ? Any idea on how to rewrite this for 2.0? I would suggest adding a check to ensure that base.GetProperties() returns at least one element before you index into the result of base.GetProperties(). @kmoo01: That's a great question. The PrincipalPermissionAttribute does not allow for adding additional roles, you can only get or set a single role. Hi, very nice but the code won't work in Mono. Tested with mono 2.10.2, to no avail. This is best one article so far I have read online. I would like to appreciate you for making it very simple and easy. I have found another nice post related to this post over the internet which also explained very well. For more details of that post check out this link. Abhi, I have a situation. I have to user access rights from Web to an API call as attribute class. Attribute value will be dynamic everytime. So, please let me know, how can i pass web application value to an API function under attribute dynamically. I desperately tried to run the "exercise" you suggested ! but could not figure out how to solve it. I'm looking for a way to dynamically add attributes on a specific member method of my class.